Should you have purchased a home with a pool already in the backyard, then it likely was customized to meet the preferences of the previous tenants. Some quick and easy pool renovations can turn that pond of water into your own personalized sanctuary. If you have the same pool from 10 or 20 years ago, there’s a good chance that your backyard looks a lot more updated than your pool and that your swimming pool is in desperate need of a pool remodel. 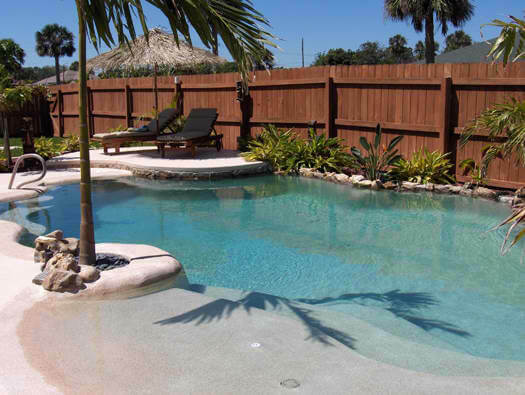 Hot new pool features are one of the top reasons why pool owners consider a swimming pool remodel. Fairly economical compared to other renovations, adding or altering the current features of you pool can keep it looking fresh and updated. One of the top pool remodeling ideas is the finish of the pool. This is a fairly easy way to make a drastic change to your swimming pool and patio area without completely changing your backyard. Safety precautions are always a worthwhile pool remodel. If you don’t already have a 5 foot fence with a self latching and closing gate surrounding your pool, add one. Consider adding an alarm as well for additional security. Yes, a swimming pool remodel can actually save you money, particularly if you’re switching to a more energy efficient pool pump (these use anywhere from 30-45% less energy than a standard pump) or adding a pool cover to reduce heating costs and reduce water loss. Having a more “people friendly” swimming pool that includes a beach entry and shallow area, or that has a nearby patio, is a great remodeling idea to encourage the interaction between family and friends.